Visibility. Credibility. Isn’t that what we all want — to gain that competitive edge? That’s what SmartBiz is all about — helping clients to get that edge. SmartBiz specializes in “integrated, strategic marketing communications.” So, if you need a comprehensive marketing plan, with tactical recommendations from each area of the “Marketing Communications Umbrella,”...or simply need a single campaign or one-shot project, SmartBiz is your one-stop resource for increased visibility and credibility. Strategic integration is the key, because SmartBiz is committed to ensuring that its clients do not just market, but market wisely — cost effectively. That’s why it takes experienced professionals to analyze a competitive situation and to offer creative strategies and suggestions. SmartBiz is dedicated to servicing small-to-medium sized companies, primarily those in the professional service sector. "Carolyn is an expert at creating effective marketing strategies and executing them on behalf of her clients. Her depth of knowledge and successful track record are testaments to her realistic, effective and bottom-line oriented approaches. 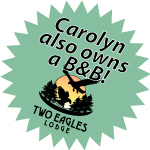 It is always a pleasure working with Carolyn and her knowledgeable staff!" "Carolyn, I love how you have been able to 'simplify' an effective marketing strategy. We really appreciate how you have reinforced this by demonstrating to us, with only casual interactions, how to expose our business more effectively. Your help drafting a 'press release', then suggesting we submit the release to a number of media outlets, had us very sceptical. I thought the article might be of interest...at best, to only the immediate market. I was blown away when your release was not only picked up in the neighbouring communities but made it to the global CanWest network. You have shown us a new way of thinking. Thank you." If you want to increase your organization’s visibility and your credibility — positioning you as an authority in your field, you need the creative expertise of SmartBiz’s award-winning marketing communications professionals.